Unless there's a mistake, this appears to be League Pass only. If Skylar wants to make the playoffs then she better teach her crew how to skate uphill. Wings normally give the Suns a game, I picking the wings in this one. If Thomas doesn’t play, the wings should definitely win. the wings need to stop trying to run offensive plays for Paris. she cannot catch the ball with a defender within arms-length of her. it's so annoying. just offensive rebound, and pass. powers trying to force up shots between 3 defenders... you are not Kobe girl. Despite the lost,Gray/Johnson continued their stellar play.Gray now has my vote for ROY.Davis with only 8 minutes. Paris:2p/0r/1-3 in 11 minuts..+8 on....-16 off.....Just goes to show +/- is a unreliable stat.However,I do think Fred should have come back with Paris early in the 4th.Dallas made their run in the 3rd quarter when Paris was in the game. I just made the same statement in the Merc thread. They should have kept both Williams and Harrison who both played well tonight. Dallas center, 7 fouls in the first half trying to stop JJ and hte Sun inside game. Yet Somehow Glory doesn't pick up a foul until 3:40 left in the third quarter. At worst, the Wings could then trade Boyette for A'ja Wilson, like the Sky probably did. 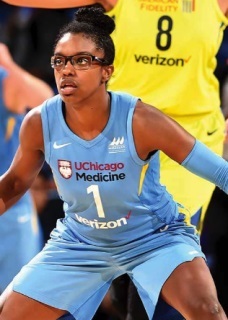 In hindsight, maybe the Wings should've drafted now-projected perennial MVP candidate and All-Time WNBA Great Jonquel Jones instead of Aerial Powers, but then maybe Powers will be a superstar someday too and maybe they don't need Jones if they get Cambage back and their top pick, Akhator ends up being a superstar. Akhator ends up being a superstar. I mean, she has to be right? She's Curt Miller certified. Except that if we use perfect hindsight, the Stars should have drafted Jones instead of Jefferson. In the 2015 draft it is pretty clear that Dallas or Seattle should have drafted Williams or maybe even Stokes.